Obviously it’s not modeled after the actual 747 carrier, but it’s just as cool anyway. Apparently it was just a project to see what could be done with foam board. By the way, did I mention that the shuttle is released mid flight and then glides down to the ground? Jason McQuistion was on a mission to show the NEAT Fair patrons what can be done with foam board, a little ingenuity, and a lot of creativity! 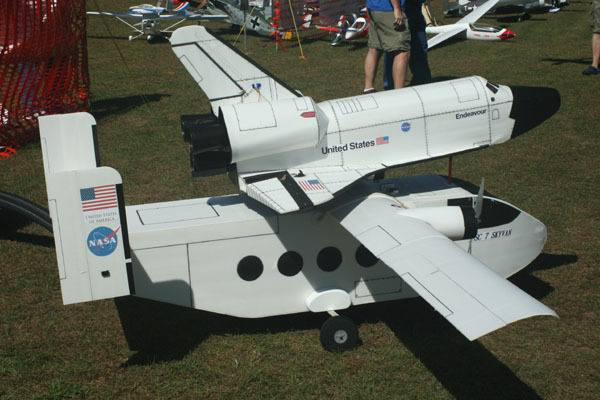 For the noon demo flights, he flew his Short Skyvan transport vehicle with the Space Shuttle Endeavor on its back. 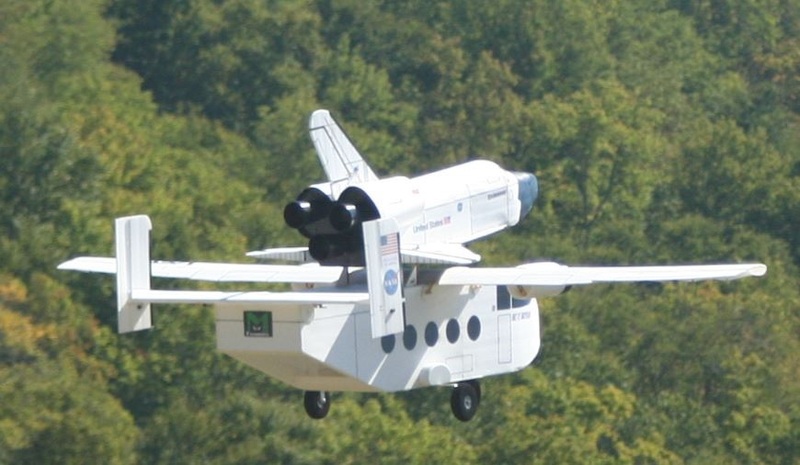 The Skyvan was flown slowly and realistically to altitude where it then released the Space Shuttle. The Space Shuttle glided, well, like the full size Space Shuttle (read brick) back to the field by Jason’s father. The Skyvan has a wingspan of 120” and uses two E-Flite .46 outrunners, two 4S 2200 mAh lipos, and two 100 A Suppo ESC’s. Flying weight is an incredible 6 pounds!